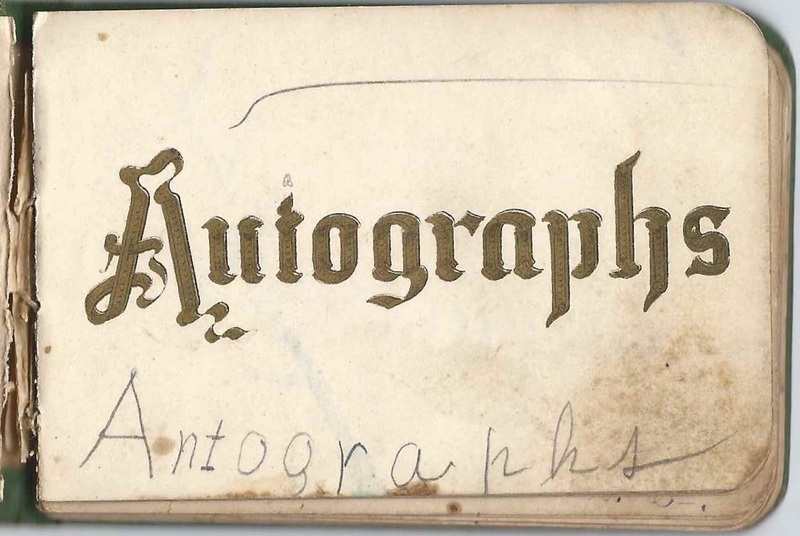 1880s autograph album that belonged to Estella Belle Hefner of Money Creek, Illinois. 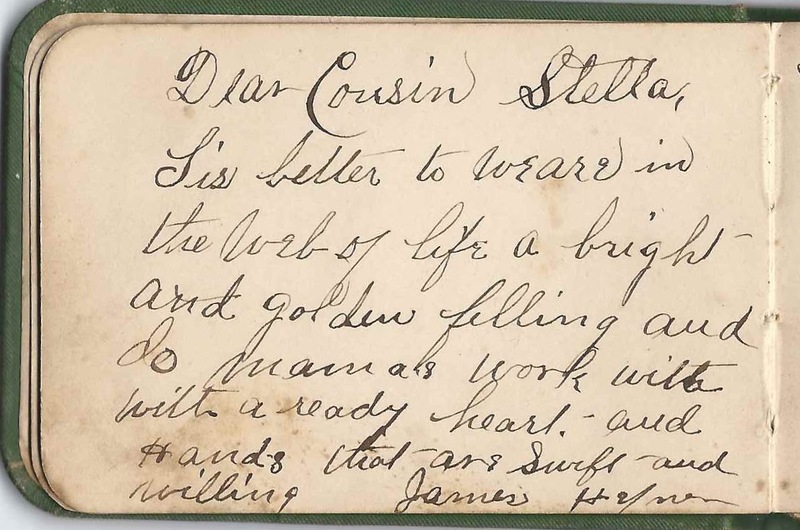 The album is approximately 3-3/4" x 2-3/4" and contains the sentiments of 30 of Estella's relatives and friends. An alphabetical list appears at the end of this post. Estella Belle Hefner was born 27 February 1878 at Money Creek, Illinois, the daughter of George Michael Hefner and Sarah Elizabeth (Durham) Hefner, who were born at Money Creek, Illinois, and Morgan, West Virginia, respectively. 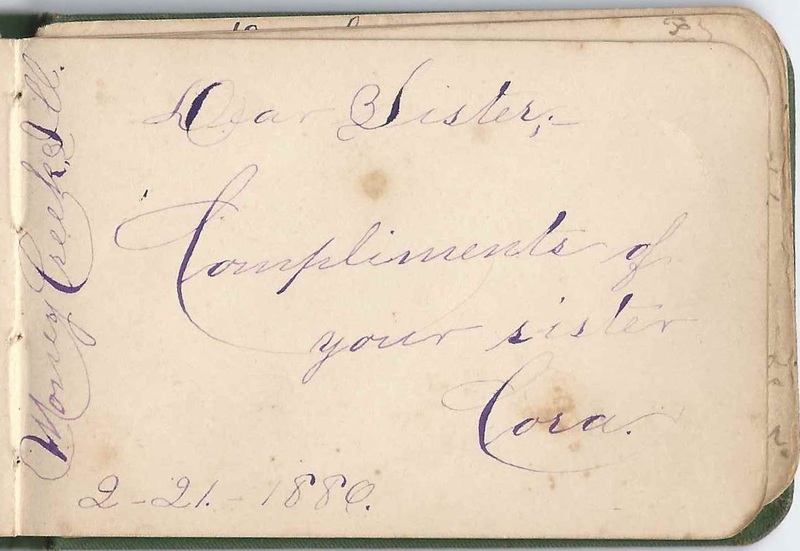 Estella's two sisters wrote in her album. 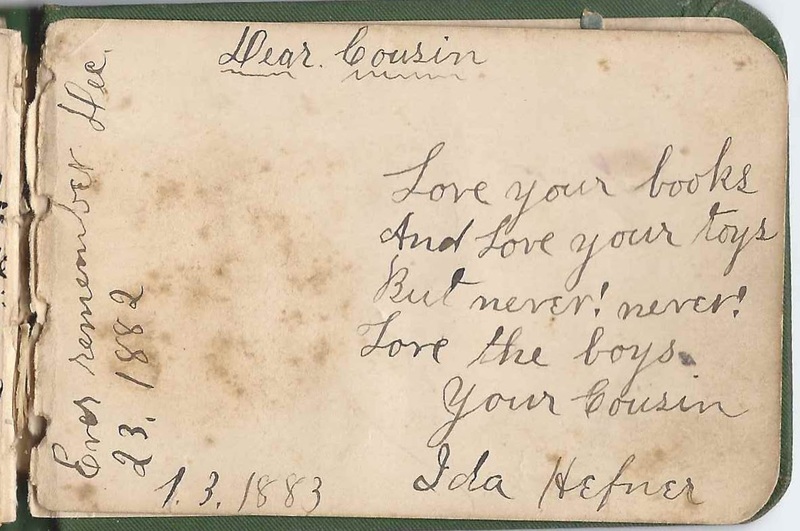 Cora Hefner of Money Creek, Illinois, signed a page on February 21, 1886. 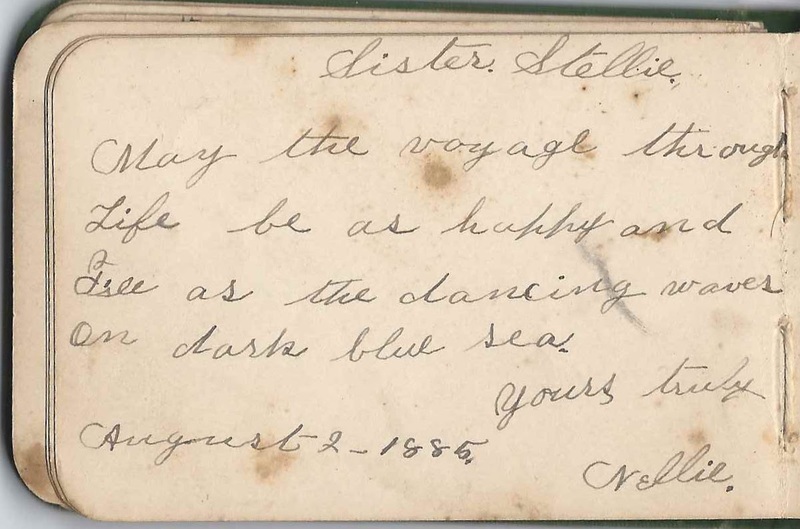 Estella's sister Nellie Rosanna Hefner signed a page on August 2, 1885. Three of Estella's cousins signed pages. Two were the siblings James Marston Hefner and Ida May Hefner. 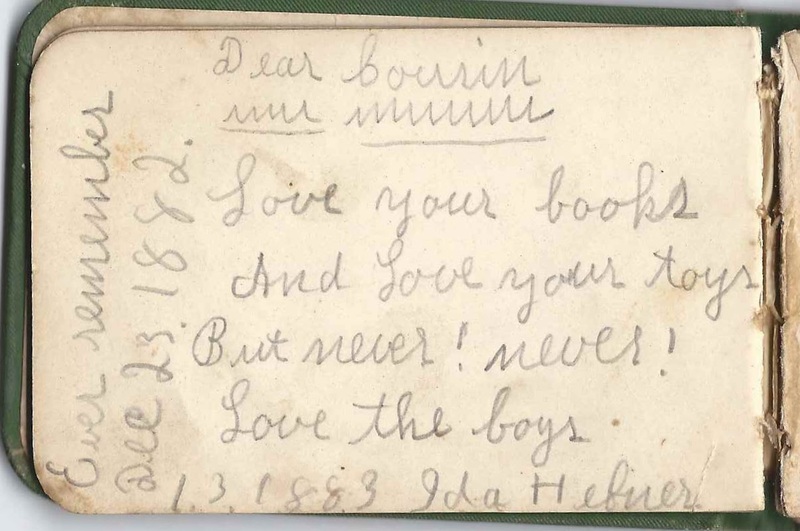 Ida signed two pages, both on "1-3-1883". 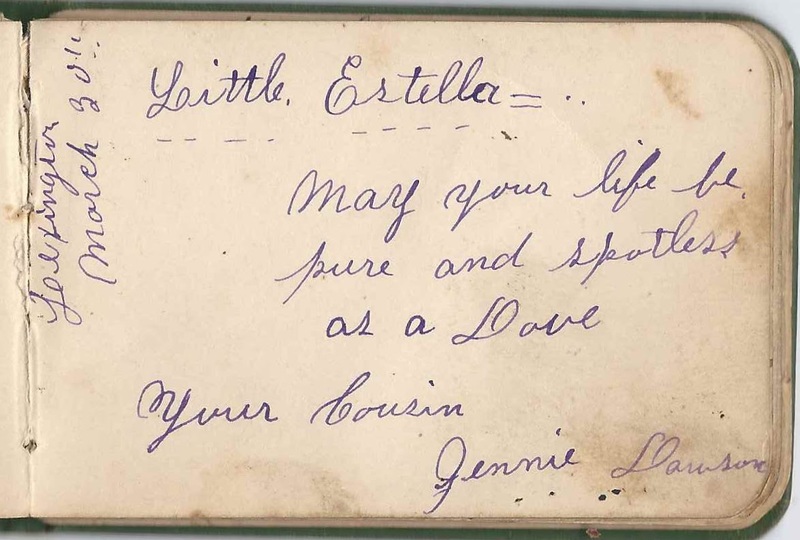 Cousin Jennie Dawson signed at Lexington, Illinois, on March 3, but she didn't indicate the year. Another person named Dawson signed a page in the album. He was George E. Dawson. In the latter half of the 1890s, Estella Belle Hefner married Benjamin Frank Flesher, son of William McCoy Flesher and Rebecca Jane Ann (Pirtle) Flesher. Benjamin was born 5 October 1869 at Lexington, Illinois. The couple had, as far as I could determine, one child, a son Benjamin Franklin Flesher, Jr. Franklin Sr. died in 1931 and Estella in 1960. If you have corrections and/or additions to the information above, or information of any of the signers listed below, please leave a comment or contact me directly. Thanks! "Your Friend Johnie". Signed another page as well. A. 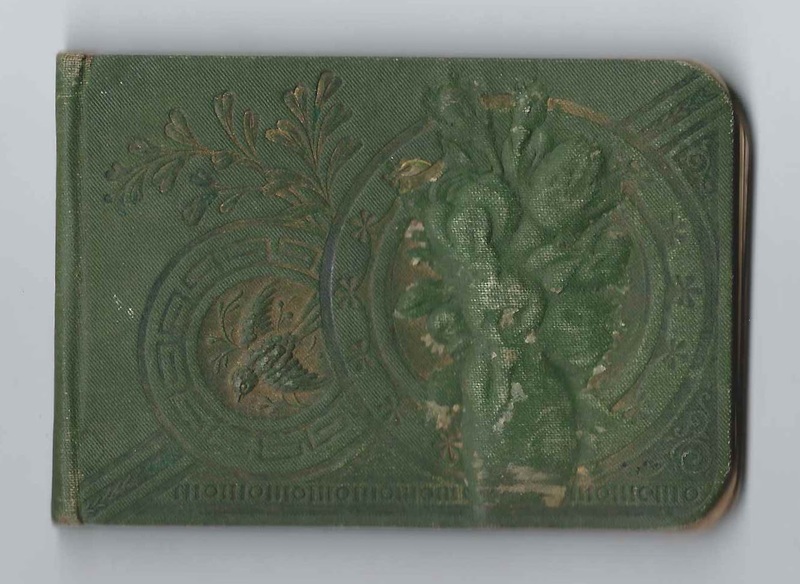 B., signed on "7-8-84"
Theodore E. Adreon, signed on May 21, 1883. He signed another page in the album as well. James Hefner; Stella's cousin. James Marston Hefner, brother of signer Ida May Hefner. Ida Hefner, signed on December 23, 1882; Estella's cousin. She was Ida May Hefner, sister of signer James Hefner. Ida signed another page in the album as well. 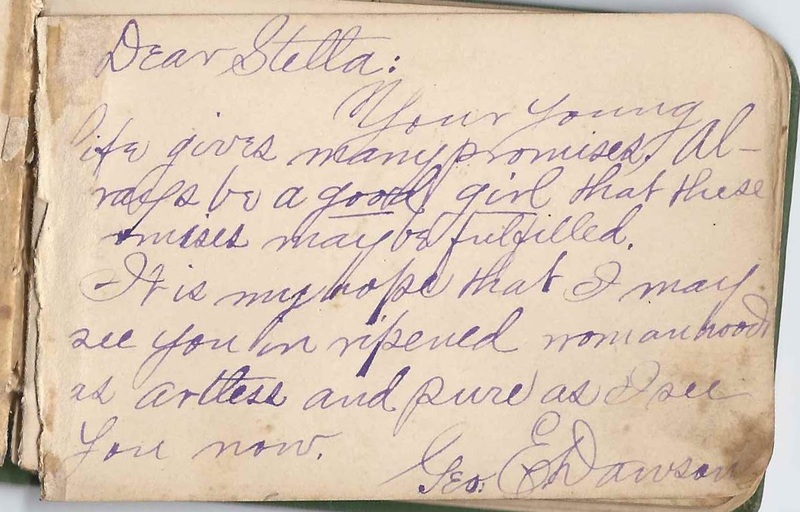 Cora, signed on February 21, 1886 at Money Creek, Illinois; Estella's older sister Cora Hefner, born about 1869. Allie Mont, signed at Lexington, Illinois, on January 3 [no year written]. It looks as though there's a dot after her surname; she may have been Allie Montgomery or Alice Montgomery or ? Hattie Richards. She was likely the same Hattie Richards who signed another page.